Owing a house / property is everyone's dream. One moves into one's new home with much excitement, new hopes and aspirations. Hindus perform traditional ritualistic ceremony 'gruhapravesam' to move into the newly built house / office for the first time. 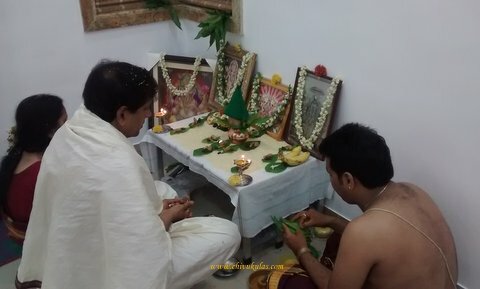 Vastu pooja, Satyanarayana Vratam, Venkateswara Swamy Deeparadhana and other such poojas are performed during Gruhapravesam. These poojas help in purifying house by warding off the evils and vastu doshas, if any. Chanting of Vedic hymns while performing poojas fill-up the air with positive / power-packed vibes. This makes the place a livable one for a happy and healthy living of the residents. Gruhapravesam involves procedural events. These slightly vary from one region to the other though the main rituals / events are almost same for all. The celebration of 'gruhapravesam' is an occasion of joy. All the near and dear ones are invited to join the celebration and bless / wish the owner. Preparations for gruhapravesam are done well in advance for a hassle-free and tension-free celebration of the event. The Hindu months of Maagham, Sravanam and Kartikam are highly auspicious for performing gruhapravesam. Other Hindu months are also good based on scheduled time / date. The date i.e 'sumuhurtam' is fixed on consulting the family astrologer. After the date is fixed, relatives / friends are invited and necessary arrangements / preparations for the function start well in advance. 3. Coconuts for breaking at each door of the house. 15. Photos of ishta daivam (gods) like Lord Ganesha, Lord Venkateswara etc. 18. Pooja materials like aarti plate, panchapatra and udharini (plate, tumbler and spoon) preferably silver ones or as per your affordability. Gruhapravesam involves step-wise procedural events. Clean / mop the floors of the new house the previous day. Tie mango leaves toranam, draw rangoli i.e muggulu. No one is supposed to enter the new house / office before performing 'gruhapravesam'. On the day of gruhapravesam all the family members and relatives reach the place and stay outside making necessary arrangements for the function like applying chandan paste and vermilion (i.e kumkum) on the yellow pumpkin. The owner of the house and the family members hold photo pictures of their istha daivam (i.e gods / goddesses), preferably Lord Ganesha, Lakshmi Devi, Satyanarayana Swamy, Venkateswara Swamy and get ready to step into their dream world. At 'muhurtam' time while the priest chants mantras, the owner lights up camphor placed on the pumpkin and offers aarti to the main entrance door. He / she hits the pumpkin hard at the centre of the main entrance and breaks it into two halves. 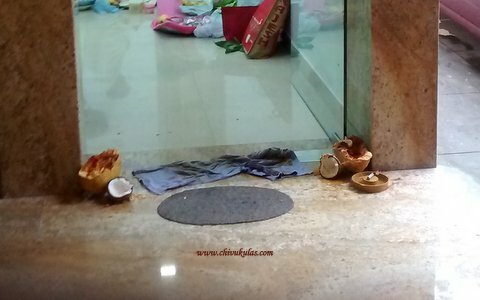 Then coconut is broken into two halves and each is placed at either side of the entrance. Turmeric powder and kumkum are applied on these. He / she then steps into the house followed by the other family members. With rejoiced faces, the procession goes to the pooja room mostly in the North-East corner of the house and the photos of the deities are placed on the temporarily arranged mandapam. Many traditional Hindus prefer sprinkling of gomutra (cow's urine) all around as it is believed to purify the house. The priest and the family members go to the pooja mandap and make arrangements for Ganesha pooja, Vaastu pooja, Navagraha pooja and other poojas as per the wish of the owner. The poojas are performed one after the other. While vaastu pooja continues, the wife of the owner gets into the kitchen to light up the stove. In some traditional families, the traditional stove by placing bricks is preferred. But in the present days, new stove, if affordable is preferred to the traditional one. The house-wife boils cow's milk in a new container and allows the milk to spill over 3 times. Kheer (payasam) is prepared with the spilled milk and is offered as naivedyam. Vaastu pooja is the main event in gruhapravesam. After pooja, turmeric paste is smeared on ash gourd (gummadi kaya) and kumkum dots are applied on it. This is hung at the main entrance door to ward off evil eye i.e dishti. Vastu pooja is followed by Navagraha pooja, Vaastu Homam, Ganapati Homam, Venkateswara Deeparadhana, Satyanarayana Pooja. These poojas are performed depending on the convenience, affordability and willingness of the family. Finally the family members and all the invited guests / relatives relish traditional feast. There is a spread of laughter, rejoice, happiness all around. On the night of gruhapravesam, the owner along with family members has to stay in the new dream house and sleep for 3 continuous nights.